Your wedding dress is one of the most important parts of your special day—besides, you know, marrying the love of your life. It’s essential that you find the dress of your dreams, but that doesn’t mean you have to stray from your eco-friendly tendencies. These are some ways that you can have an environmentally friendly wedding dress without sacrificing style or breaking the bank. Look into designers with sustainable gowns. With the trend of environmental consciousness on the rise, more fashion designers are taking notice and creating eco-friendly options. There are several amazing designers and brands that cater to this within the wedding market. Deborah Lindquist has a special line called Eco Couture Wedding Collection, which has eco-friendly bridal gowns and accessories. These are all made from recycled lace, wool, and other fabrics, and they come in a variety of shades and styles. Minna Hepburn, founder of Minna, describes her line of clothing, including a wide range of wedding gowns, as “Eco Luxe”. She uses all organic and recycled materials, and the line has tons of options, starting as low as $780. The Cotton Bride uses all natural fabrics, such as linen, cotton, and silk, to create gorgeous, eco-friendly wedding dresses. These are just a few of the brands that design environmentally friendly dresses. Be sure to keep searching, as popular brands are always creating new, eco-friendly options. Nothing makes a mother happier than seeing her daughter wear the same dress she wore on her wedding day. Consider wearing the dress your mother, grandmother, or aunt wore on their wedding day. 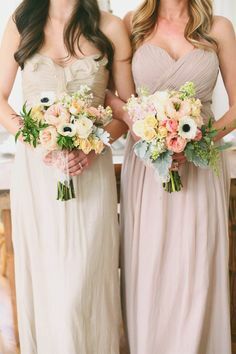 If you want something a bit different or more modern, you can always go to seamstress and have the sleeves cut off, the dress shortened, or some glitz added. This will still cost much less than a brand new wedding dress, and you’ll be recycling an old dress instead of getting a new one you’ll only wear once. Vintage is always in style. Go shopping at your local thrift shops, consignment boutiques, or Goodwill stores; you never know what you might find. Recycling an old wedding dress is a great way to keep your wedding environmentally friendly. This is the perfect option if you’re going for a more vintage or rustic look. You can find vintage wedding dresses for as low as $15 at some of these stores, so there’s no harm in looking. You might just find the dress you’ve been looking for! If that isn’t the case, dresses can always be altered or re-designed to better suit your style. There are several options that fall under the umbrella of designing your own dress. 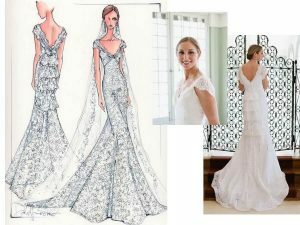 If you’re handy with a sewing machine, or you know someone who is, physically designing your own wedding dress is always an option. You can recycle materials from old wedding dresses, or you can purchase organic fabrics and materials to use for the dress. This allows you to have a truly one-of-a-kind wedding gown. It’s a great option if you’re someone with a distinct sense of style or particular vision in mind. Having a custom gown created can take quite a bit of time, so don’t leave this waiting until the last minute. If finding a local seamstress or designer isn’t an option, there are also websites that let you have a say in the design of your wedding gown. Some even let you design the entire gown from scratch. One example is Tara Lynn Bridal, which makes custom hemp wedding dresses that incorporate materials and items of your choosing. Past customers have used pieces of family heirlooms, tablecloths, family members’ dresses, and more. This is a great way to combine recycling materials with opting for eco-friendly materials. These are just some ideas to get you thinking of how you can find the dress of your dreams while also keeping your wedding environmentally friendly. Whether you end up with a $20 dress from Goodwill, or you go with a $2500 custom gown from an eco-friendly designer, all that truly matters is that you feel beautiful and special on your wedding day. Photos courtesy of Minna, Top Wedding Designs, and Pinterest.